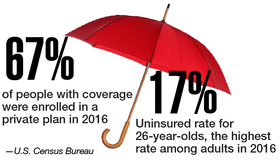 The number of Americans without health insurance continued to fall in 2016, according to new data from the U.S. Census Bureau. Last year, 28.1 million people, or 8.8% of the U.S. population, were uninsured for the entire year, down from 29 million people, or 9.1% of the population in 2015. Job-based insurance continued to be the most common source of coverage. According to the data, 55.7% of people get insurance from their employers, while 19.4% are covered by Medicaid and 16.7% by Medicare. Download the PDF.